What does one wear to a birthday party on April fools day in San Francisco at Golden Gate park? Why, a silly outfit, of course! I’ve been told I look like a dutch milkmaid in this corset so I decided it would be great to pair with my favorite stuffed alpaca for a picnic in the park. We searched and never found the horde of the Saint Stupid’s Day parade in downtown but had a lovely time in the park. 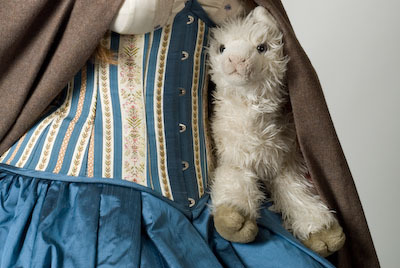 Both the corset and alpaca got lots of attention from park visitors. I paired it with a matching silk skirt and added a cloak (both made by me as well).